Many, many years ago, I spent my sixth grade in a large brick school house that is no longer in use. It had a wonderful library that was shadowe and wooden and everything a magical library should be. It had shelves on the walls and shelves on a the walls of a hall that led to a secone open area that was used for reading and special events. Marvolous things could be found on those shelves. Back then, there was no fantasy and science fiction section. All the fiction was shelved together, and if you wanted to read something filled with magic and wonder, you had to happen upon it by accident while carefully searching the shelves. Normally, one found books on rabbits and foxes, dogs and horses, little houses on prairies and Dr. Dolittle. But, one day, I found something different, a book of the exact kind I always hoped for when I went to the library–a book of magic and wonder. It was called The Kingdom of Carbonel by Barbara Sleigh, and it was everything a book should be. It had magic, impressive talking cats, a charming main character and her friend, royal kittens, a bad witch, a cat war, and a bittersweet ending that wrung your heart but made perfect sense. Only, after I left that school, I never saw it again. No one else had read it. No one else had even heard of it. In college, I looked through a bin of cheap books outside a bookstore and found it! 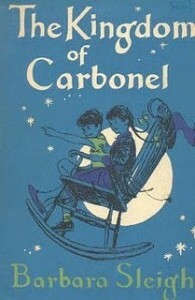 Or maybe I found Carbonel, the book that came before it. I was so excited. But I was a college student. I could not afford to buy it, even out of the cheap bin. For years, I regretted not somehow getting the money together, because I never saw it anywhere again. It took us three summers to finish the two books, and, unlike some books that fade with time, they were just as magical, just as wonderful, just as marvelous as I remembered! (Or the second one was, the first one, I’d never read.) The magic was perfect children’s story magic. The characters were charming. The cats were wonderful. The books came out in the 50s in England. There was magic, flying broomsticks, and a witch referred to at least one spot as “You Know Who.” I could not help wondering if this book had been a favorite of another author’s when she was young. Orville loved it. Sharing it with him was such a wonderful experience, like stepping around the corner into a secret glade filled with flying rocking chairs and a red liquid that makes you able to understand the speech of animals and being allowed to live there, if only for a little while. Now, my hope is that someday, Juss will be old enough to enjoy them, too.